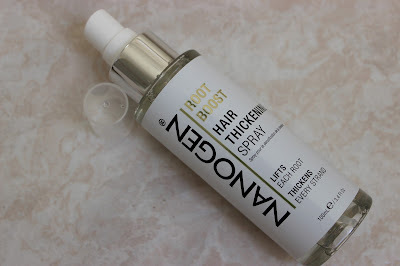 Nanogen Root Boost Hair Thickening Spray isn't the sort of product which I'd ever have tried, had it not been gifted to me by the PR. Despite the fact that I'm always looking for ways to add the appearance of volume & thickness to my fine hair, the minimalist packaging of this simply wouldn't have appealed to me if I'd seen it on a shop shelf. Nanogen describe Root Boost Hair Thickening Spray, which is a new addition to their range, as being a light, fast-absorbing hair thickening spray that lifts each root & thickens every strand. Despite the packaging not particularly appealing to me from an aesthetic point of view, I appreciated the clear, easy to follow step-by-step directions. I also liked that the clear plastic bottle enabled me to see how much product was remaining. The spray was easy to control, both in terms of targeting the spray and controlling how much was delivered to the desired area. I absolutely loved the scent which was comforting & luxurious but unfortunately, I couldn't detect it once my hair had been dried & styled. I feel that Nanogen Root Boost Hair Thickening Spray delivers on the claims. My hair was left looking noticeably thicker, fuller & texturised. The downside was that it left a sticky residue in my hair (similar to that which can be left by some dry shampoos) & whilst this may add grit for styling, I personally didn't like the feeling and couldn't wait to wash my hair. It also left a mattified finish to my hair. Nanogen Root Boost Hair Thickening Spray costs £9.95 for 100ml which I feel represents good value for money.